The music of Sharpe made waves among the historical elitists when each episode was opened with a theme that included electric guitars. How many people can recall being in another room when the opening chords were struck and went running for the telly? It was such a distinctive theme for a Penninsular Wars-set series, even with the anachronistic guitars, that it ranks right up there with the famous opening music from MASH, Miami Vice, Mission Impossible, even Twilight Zone. 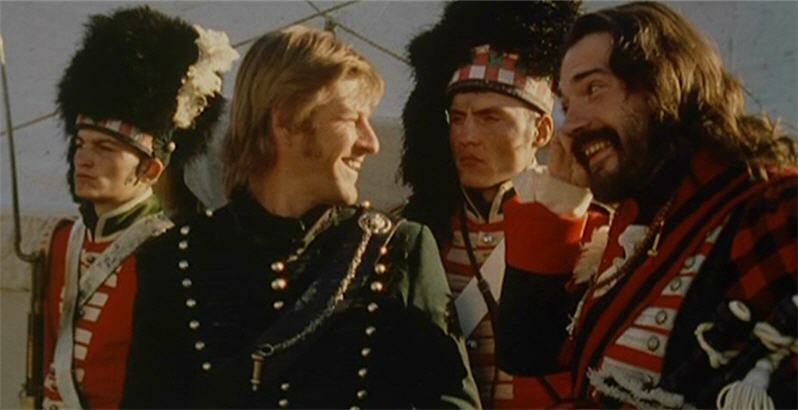 The soundtrack of the Sharpe series, scored by John Tams and Dominic Muldowney, was spot on, delivering the right words, the right notes at the right times. The music soldiers would have heard and enjoyed while on campaign or in the ale houses and taverns was as essential to the British Army as salt beef. While most songs and marches had their roots in centuries old folk music others were composed by coffee house fops who sold their sheet music for a penny a page. Many a campfire serenade led to new verses, new rails, all based off of age-old melodies. Of a richer tradition was the regimental music played by the pipes and drums that accompanied the soldiers. High spirits marked the quick march melodies, the slower marches were deliberate and majestic. The most well-known of the Regimental songs was that of the 95th Rifles. To this day, Over The Hills is still played by the Drums and Bugles of the Rifles as their theme song. The history of the catchy tune actually dates back to 1706, long before the Rifles adopted it as their theme and oddly enough, was extremely popular in Colonial America. This tune was published in Thomas D'Urfey's Pills to Purge Melancholy (Originally in 1706). It appeared in The Recruiting Officer, a comedy by George Farquhar and in John Gay's The Beggar's Opera (1728). According to one source the tune is an older air whose origin is unkown. Another sources states the original air was Jockey's Lamentation or Jockey met with Jenny fair. John Tams wrote new lyrics to the tune for Sharpe's Rifles. The tune was very popular in Colonial and Revolutionary America. The following are the verses sung by John Tams over the closing credits of the various Sharpe episodes. They're shown in the order of the films and have probably been rearranged to fit in with the "theme" of each particular episode. The first verse is from the first *and* second episodes, the second verse from the third episode, etc. Possibly the chorus is sung "TO Flanders" after the first verse and "THROUGH Flanders" thereafter. Some words are spelt phonetically to indicate pronunciation. Differences in the last line from other verses are indicated by asterisks. These are the words John Gay wrote. The earliest printed copy of this tune is found in Thomas Durfey's Wit and Mirth: or, Pills to Purge Melancholy (Volume in 1720) as The London Prentice. It was popular in England, Ireland and Scotland. Variants and alternate titles include: The London Apprentice and The Jolly Boatsman (a variant in Kentucky). To blow the candle out. Much folklore has arisen regarding this tune. One source states the tune was popular as far back as the reign of Elizabeth I and was played whenever a regiment left town or a man-of-war set sail. Another theory is that the tune originated in 1758 when Admirals Hawke and Rodney were watching the French fleet off the coast. Research has shown that the tune was sung in America as early as 1650 and was a traditional fife tune, imported from England as Brighton Camp. The tune became generally popular during the Revolution. In Ireland it was known as The Rambling Laborer and The Spailpin Fanach and was first published in Dublin in 1791. The tune was also used for lyrics to a drinking song, Waxie's Dargle. Waxies were candlemakers, traditionally women. "Dargle" was a term for a company or "works" outing (the name apparently derives from the Dargle River), an annual trip to Bray. Another source says the Dargle (a popular pub) was also a holiday haunt of the late eighteenth century Dublin candlemaker and grocer, Waxy O'Connor. Auld one: (old one) wife; Auld lad: (old lad) husband; Uncle: some versions use "Young Kill"
The music to Heart of Oak was by Dr. William Boyce (1711-1779). The English words were written by the famous actor David Garrick (1716-1779) in 1759. Garrick is also credited with the theatrical blessing, "Break a Leg" as he was reportedly so involved in his performance of Richard III that he did not notice the pain of a fracture he incurred. Dr Boyce was a songwriter in London, beginning around 1730. In 1757 he reached the peak of his career, being put in charge of the King's Band of Musick. He received a doctorate in 1749. In 1758 he was the organist at the Chapel Royal. His first compositions to appear in print were published in 1747. Boyce retired from music due to deafness and retired to Dorset. There is an American set of lyrics, The Liberty Song. For if they won't fight us, we cannot do more. Chorus This is the American set of lyrics, known as The Liberty Song. The tune is believed to be over 400 years old and is most likely of Irish origin as it used the old Irish gapped scale (which did not use the 4th and 7th notes of the modern scale). The song appeared frequently in England after 1790 on broadsides printed in London, Birmingham and Preston. The song, also known as Broken-Hearted I Wander, had widespread popularity during the Napoleonic Wars and inclued references to King George and Napoleon Bonaparte. Lyrics by William Barrett, although very similar, do not refer to the Napoleonic Wars. There are several variants of the tune. She relies upon George for the loss of her love. My bonny light horseman, in the wars he was slain. To the gods I'll complain for the loss, of my love. My bonny light horseman that was slain in the wars. And kiss his cold lips o'er and o'er again. When the drum beat to arms and did force him from me. And by all his regiment respected he were. A maid live and die for my love that was slain. Commonly known as a London street melody which appeared often in comic songs. The ballad was also known as Young Edward, the Gallant Hussar. It appeared on numerous broadsides in the early and mid 1800s. Many of these can be found at the Bodleian Library. The Hussars were members of European light-cavalry used for scouting. The units were modeled on 15th-century Hungarian light-horse corps. In the 19th century some British Hussar regiments were converted from Light Dragoons. She espied her young gallant hussar. With glittering swords by each side. So wed not your gallant Hussar. To wed with my gallant Hussar. So pray do my company shun. I will wed with my gallant Hussar. And forsake cruel war, he did cry. Legend has it that this tune first appeared in 1641 in Ulster. Richard Talbot (1630-1691), a Catholic and royalist, had been made Earl of Tyrconnel after the Restoration. Later, King James II appointed him Lord Lieutenant of Ireland (1686). He pursued strong pro-Catholic policies. Even after James was deposed in England, Tyrconnel governed Ireland in James' name. Irish Catholic forces were eventually defeated by William of Orange. English and Irish Protestants took up the song as their melody during that time. Irish writer Brendan Behan contradicted the claims by declaring the words of the chorus were a corruption of the Gaelic: "An lili ba leir e, ba linn an la" - roughly "The lily won the day for us." According to The Sources of Irish Traditional Music (1998) it translates as: Lilli/ bu le'ir o/, bu linn an la/ - Lilli will be manifest, the day will be ours. William Lilly (1602-1681), a famous astrologer who made predictions regarding British politics of the time, made the prediction "The Prophecy of the White King", in 1644 after Marston Moor, that a King would be beheaded or killed. Lilly wrote a letter to Charles I warning him of the prophecy. An alternate story, from Songs That Made History by H. E. Piggot, states the refrain came from a popular Irish song when then Roman Catholic James II came to the the throne, containing the Irish words, "Lere, lere, burlere." Lere meaning "religion or faith" and burlere meaning "your faith". According to Piggot, a form of the tune was printed in 1661 in An Antidote Against Melancholy which was set to words beginning with "There was an old man of Waltham Cross". John Gay used the tune in The Beggar's Opera which became the British Broadcasting Corporation's signature theme during World War II. Just as "John Bull" would later be used to represent Englishmen, "Brother Teague" was then the nickname of the Irish. And we shall have comissions galore. Thought to be an American adaptation of the Irish tune Shule Aroon, this song dates back to the 17th Century. It is also known as Buttermilk Hill and Shule Agra Johnny's Gone For a Soldier was popular during the the American Revolutionary War. Alternately, the tune Shule Agra arose out of the Glorious Revolution of 1688. The Irish supported James II, and were defeated at the Boyne. William III, who defeated James, offered forgiveness to the rebels who would swear loyalty to him, but many preferred exile. The only evidence for this theory, is that some English versions have the line "But now my love has gone to France, To try his fortune to advance...."
The words are by Thomas Moore (1779-1852). (The last verse is a later addition.) The tune is an Ancient Irish Air The Moreen. In 1798 two of Moore's friends participated in the rebellion of the United Irishmen. One died in prison, another was wounded and another later hung. He refused to testify against them. A traditional Irish tune sung by Ramona and Patrich Harper in Sharpe's Honour. However, the origins are actually contested. The actual history of the song is suggested by the fact that a collection of ballads, dated between 1813 and 1838, is held in the Bodleian Library. The printer, Catnach, was based in the "7 Dials" area of Covent Garden, London. The Bodleian bundle contains "The Wild Rover". The Greig-Duncan collection contains no less than six versions of the song. It was compiled by Gavin Greig 1848�1917. This is also known as Spanish Ladies and Farewell and Adieu to You. A traditional English sea shanty, describing a voyage from Spain to the Downs, it was called a capstan shanty (a shanty sung as the capstan was turned to raise the anchor), sung as ships were homeward bound. A ballad by the name of Spanish Lady was registered in England December 14, 1624 with the Stationers' Company. It is possible that tune is related to this tune or one of many variants listed in the registry. The song's namesake, "Spanish Ladies," can most likely be traced to the period between 1793 and 1796 in which British ships would often dock in Spanish harbours while Spain and Britain were still allies in the First Coalition against Revolutionary France. While this may help to contextualize the song's mention of Spain, no truly definitive dating has surfaced as of yet. However, according to the Oxford Book of Sea Songs the earliest known reference to Spanish Ladies is in the logbook of the Nellie of 1796. Its story is that of ships in fog (and therefore unable to determine their latitude by sighting) trying to find the entrance to the English Channel, between the dangers of Ushant to the south and the Isles of Scilly to the north. The sandy bottom is a good sign - and there is always the added reassurance of the width of the entrance, thirty-five leagues. A discussion in Arthur Ransome's novel Peter Duck notes that the succession of headlands on the English shore suggests a ship tacking up-channel, identifying a new landmark on each tack. Collections list different distances from Ushant to Scilly. It is variously given as 34, 35 and 45 leagues. The depth of the Channel also varies from 55 to 45 fathoms by version. Special lyrics were written to the tune for the Bluenose (a famous Canadian sailing ship which sailed out of Nova Scotia). There is no approximate age given for the song or tune. It is only listed as "famous old Naval song." An example of Tams' theory that "you don't have to tiptoe around songs in a scholarly way. You can wrest what you want from the tradition and watch it spring back into shape." The first three verses of this song, traditional with additional lyrics by John Tams, were used in the Sharpe series. The last is from the BBC Radio 4 production of The Charge of the Light Brigade. March, brave boys, there's no retreating!" The Major cries, "Boys, are yez ready?" And his firelock on his shoulder!" Do not take my daughters from me! If you do, I will torment yez! After death my ghost will haunt yez!" And I'll make you an honest woman. If I die, my soul in glory is! This ballad was printed in England on broadsides in the mid 1800s as Farewell to Your Judges and Juries and Farewell to Judges and Juries. Copies of these can be found at the Bodleian Library. There is speculation that it originated much earlier in music halls. Seven years he's transported I know. That keeps me from my heart's delight! Early records claim the words of this song on the early broadsides were about a soldier, not a sailor. In later stall sheets the occupation was predominantly sailor. This song was modelled on the Irish song The Rambling Suiler, which means the rambling beggarman. The Rambling Suiler, in turn, parallels several songs allegedly composed by or about James V of Scotland who used to wander his kingdom in the disguise of "Gudeman of Ballengeich." His amorous exploits while in disguise are the subject of many of those songs. To court young girls and handsome. With my false hart and flattering tongue I court all girls both old and young, I court them all and marry none, And still be a rambling sailor. From Plymouth Sound to Dover. But live a rambling sailor. I said: My dear, what do you choose? To travel with a rambling sailor. When I awoke all in the morn I left my love a-sleeping. She may stay there til the day of doom. Some miles across the ocean. And I'll be a rambling soldier. To range this country over. From Plymouth back to Dover. I'm not afraid to mention. A guinea and a pension. It's - the rambling soldier! From the coalfields in the north of England. Probably from the early nineteenth century. And where's your dashing Jimmy? And he's better gone to the gallows. And now they've got young Jimmy. A song entitled "The New Bath" found in Playford's dance books from the 17th century is thought to be the origin. However, it is also suggested that it was derived from the Dutch march "De Jonge Prins van Friesland" ("The Young Prince of Friesland", referring to Prince Johan Willem Friso); the first notes of this tune are similar. The march was introduced to Britain during the reign of the Dutch Stadholder-King William III. Today it is played as the Royal Inspection March in the Dutch army, and as a march to the crown prince. The first known association of the tune with the regiment is in 1706 as 'The Granadeer's March', and the first version printed with lyrics from around 1750. It was a popular tune throughout the 18th and 19th centuries, and remains so until this day. During Operation Market Garden, a few men of the British 1st Airborne Division are said to have played this song using a flute and a few helmets and sticks as drums. Who carry caps and pouches, and wear the loup�d clothes. There is a contention that Robert Burns' "Scots, Wha Hae", a patriotic song of Scotland which served for a long time as an unofficial national anthem of the country, but has lately been largely supplanted by the modern "Scotland the Brave" and "Flower of Scotland", were the original lyrics set to a tune bearing a strong resemblance to the familiar tune of "Scotland the Brave" although it was played as a gentle air and not a rousing martial tune. The lyrics were written by Robert Burns in 1793, in the form of a speech given by Robert the Bruce before the Battle of Bannockburn in 1314, where Scotland maintained its sovereignty from the Kingdom of England. Although the lyrics are by Burns, he wrote them to the traditional Scottish tune Hey Tuttie Tatie which, according to tradition, was played by Bruce's army at the Battle of Bannockburn, and by the Franco-Scots army at the Siege of Orleans. The tune for the older song is very similar to the more familiar tune for Scotland the Brave, which adds ammunition to the argument that today's Scotland the Brave was born from Burns' Scots, Wha Hae". Scotland the Brave is the more widely-known of the two songs and is also the authorised pipe band march of The British Columbia Dragoons of the Canadian Forces and is played during the Pass in Review at Friday parades at The Citadel and The Virginia Military Institute. In 2006, it was adopted as the regimental quick march of the Royal Regiment of Scotland. In the 1982, 1986, and in the 1990 FIFA World Cup, the Scottish national team used it as its anthem prior to using "Flower of Scotland". Her vines and her bowers and her soft sunny skies! Where freedom expires amid softness and sighs! Towering in grandeur are dearest to me! The spirit of Scotia reigns fearless and free! And proudly she sings looking over the sea! When armies and empires against me were hurled! Of England, of Denmark, of Rome and the world! Deep groves of steel trodden down in their paths! Triumphantly riding through ruin and death! Wave o'er their bloody tombs! Deep in gore is the green tartan wave! Shivering are the ranks of steel! Dire is the horseman's wheel! Victorious in battlefield, Scotland the Brave! There are many theories about the meaning of the song. One interpretation is that it is attributed to a Jacobite Highlander who was captured after the 1745 rising. The English played games with the Jacobites, and said that one of them could live and one would die. This is sung by the one who was sentenced to die, the low road referred to being the passage to the underworld. Some believe that this version is written to a lover who lived near the loch. Another interpretation is that the song is sung by the lover of a captured rebel set to be executed in London following a show trial. The heads of the executed rebels were then set upon pikes and exhibited in all of the towns between London and Glasgow in a procession along the "high road" (the most important road), while the relatives of the rebels walked back along the "low road" (the ordinary road travelled by peasants and commoners). It captures some of the romantic spirit of the lost cause of Bonnie Prince Charlie. "The Bonnie Banks o' Loch Lomond", or simply "Loch Lomond" for short, is a well-known traditional Scottish song. It was first published in 1841 in Vocal Melodies of Scotland, but is known to have originated much earlier. Loch Lomond is a large Scottish loch located between the traditional counties of Dunbartonshire and Stirlingshire. The Bonnie Banks o' Loch Lomond is often the final piece of music played during an evening of revelry (a disco or dinner, etc.) in Scotland, a phenomenon not seen in other parts of the United Kingdom. by waving of his hand. and passed it off as a joke. wrapped up in a soldier's cloak. and children I have three. you treat 'em to a glass. you say you're a country lass. and she couldn't tell his name. and roll'd her up in my cloak. saying, "Fare you well my dear. along with you I'd stay." say you're a country lass. wrapp'd up in a soldier's cloak. O! won't you marry me?" but one is enough for me." Why hadn't you told me so? if ever they come to know. " and she could not tell his name. John Tams adapted the words of Horatius Bonar for his own arrangement of this hymn. The use of this hymn in Sharpe's Justice was not historically accurate like most of the songs and hymns throughout the Sharpe series were. Bonar would have been only 4 years old during the time in which Sharpe's Justice was set. The words of this hymn was set to music in 1891 by Ira D. Sankey who sang it as a solo in the Tabernacle in London at the funeral of his friend, C. H. Spurgeon, the great London preacher. Vance Randolf, a famous folklorist who studied the folklore of the Ozarks, included the hymn in his "The Ozark Folksongs Collection" part of a four volume work as published by the State Historical Society of Missouri between 1946 and 1950. Thus would we pass from this earth and its toiling? Who'll sing the anthem, and who'll tell the story? Will the line hold; will it scatter and run? Only remembered for what we have done? and only remembered for what we have done. Only remembered for what I have done. Reaping the fields we in spring time have sown? Only remembered for what he has done.